Some of you may have noticed that Sparkles & Stretchmarks disappeared over the weekend. I didn't make any announcements because I didn't want any attention drawn to it....I simply wanted to disappear. However, somewhat to my surprise, I did receive some tweets and facebook messages asking why it was down. I love to write....I always have. I find so much comfort in being able to express myself through the written word. You see....lately, I have found myself becoming more and more depressed by blogging. I know that a lot of bloggers who have been on the scene for a while often complain about new bloggers only wanting to get involved for the "freebies" and the paid work....but of course, we do all enjoy those perks of this hobby. But that's all they should be...perks. Lately I have found myself comparing the "perks" I am lucky enough to get to the perks that other bloggers get, and feeling inferior. That in itself is bad enough, but my main issue has been that there seems to have been a shift toward image in blogging. Sometimes I can't help but feel that people aren't as interested anymore in writing talent, and that it's become more about putting forward the right image or having the right look. I stay in the car whenever I can and send Jon in to pick up groceries, or run errands - I keep the curtains drawn all day so that nobody can look in and see me sitting in the living room. It is a truly horrible feeling to hate how you look, and hate your body but not have the power to do anything about it until medical professionals decide to figure out what the problem is and how they're going to address it. But lately that hasn't been the case. It confirms my belief that I could spend hours writing an interesting post, but a simple photo that shows a perfect and coveted home lived in by a perfect smiling family will be much better received. And it all just serves as a reminder that I'm not good enough. But I don't want to feel this way and I don't want to lose passion for my blog, which I've worked so hard to build. When I first started this blog, it was intended to be a place to be real - to show the real highs & lows of pregnancy instead of the elusive "Glowing" side we're all supposed to experience! I feel I've lost my blogging identity and purpose somewhere along the way, and I want to get it back. I don't want to pretend to be something I'm not and I don't want to impress anybody - I want to live MY life as me, flaws and all, and have fun doing it. So NO more endless selfie's - trying to find the most flattering angle and using Instagram filters until they're almost unrecognisable. If people don't like what they see, and I'm not deemed good enough to sell products for someone - then so be it. On a lighter note...something interesting came out of my unplanned blog-break this weekend. And now I find myself wondering who is out there, reading my words. Being a blogger is a very surreal experience - you put yourself out there, day after day, sharing your life and your innermost thoughts. And really - you don't have a clue who is listening. But we never really know exactly who is out there reading what we put out into the world. I would LOVE - just once - to know who YOU are. You right there, reading these words right now....who are YOU? Are you reading this at home? On a bus? Are you sitting at your computer? On a phone? Did you stumble across this blog while looking for something else? Do you read it often? Whenever I post on this blog, I kind of imagine myself shouting out in a darkened room - I can vent and get things off my chest but I don't know who to - and just this once, I'd love to hear some voices shouting back to me. Letting me know they're out there. 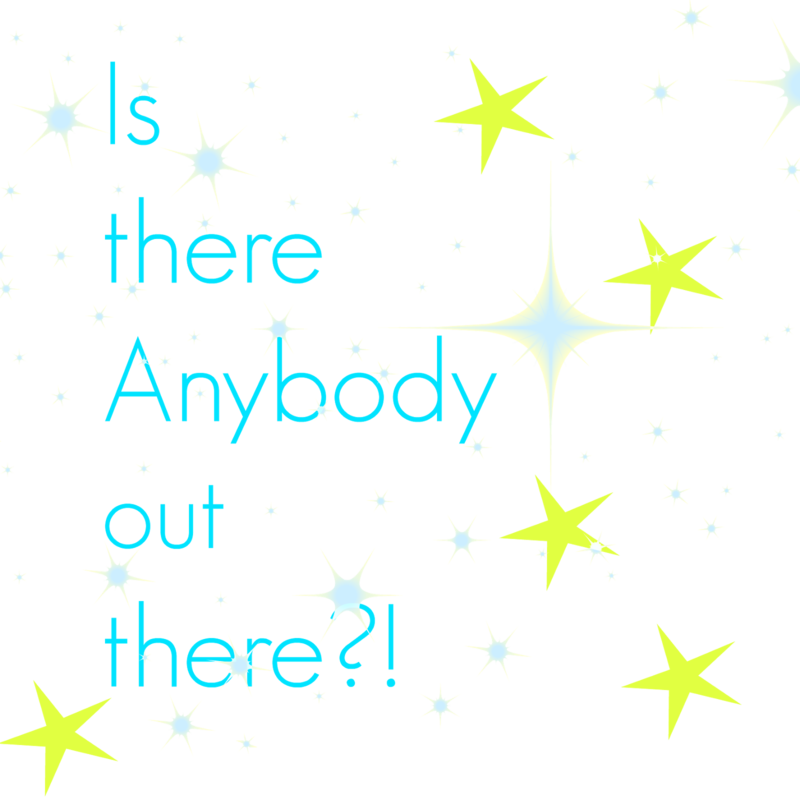 So if you're out there, if you're reading this....leave me a comment. Just this once. Maybe tell me your name. Tell me anything you want to, about you. If you are a blogger too, I would LOVE it if you left me a link to your blog - I so want to follow back and support any fellow blogger who follows me. I just happened to come across your blog via facebook. I've never been here before but I want you to know that we all have those moments when we feel as though we are just as deserving (if not more so) of this perk or that... I've been blogging for 7ish years and I see it everyday. You're blog is amazing and I truly hope that you are able to find your true blogging self again. And that you regain your health and feel fabulous again. My name is Jen from A Busy Mommy (Nova Scotia,Canada) nice to meet you. I found you through Facebook ( probably through a competition). I'm pretty new to FB and don't really read many blogs but yours is different. You seem so honest and funny and, refreshingly, your grammer and spelling is perfect. You have a beautiful child and a devoted partner so try and remember that on the days you feel down. You have what so many people dream of but I understand your desire for perfection. I am a mum of two from Belfast and am reading your blog at 5 am while feeding my little girl. Before I went off on maternity leave I found myself being jealous of people in work wondering 'why did she get that?'. It's only now, while away from that, that I realise what a lovely life I do have. I have two beautiful children, a funny, handsome hubby and a pretty messy house. I rarely get a brush through my hair and my jeans are too tight but i'm loved and respected and that's all that matters. Thanks for your honesty, it's brought you a new fan. Hi I'm Sue from the UK. I'm know as Crochet Addict UK. I'm reading your post on my phone. I have M.E. and this has affected my weight and body image. I've put on 5 stone since getting ill and it is a real struggle. Please carry on blogging the real you!!!! I prefer a warts and all blog! Life isn't all just so. To be honest I tend to spend less time reading and viewing blogs that are "perfect". I know it's hard but try not to compare. Let your blog be what you want it to be. I am the first to say I enjoy the perks but there isn't anything wrong with that. Take what you want when you want. Re your self image it might be an idea to ask for help. I find trying to find a positive thing that I like about my body helps. Also treat yourself. Pamper you. Even if it's just putting lipstick on or wearing a nice top. Not matter your size and shape if you feel beautiful that is what you and others will see. It is difficult but if you look in the mirror and say I look good you'll believe yourself at some point. I hope things get easier for you! I noticed you had disappeared but thought it was maybe a hosting error. I would rather read an honest blog. I started my blog as a way to occupy myself and help with my PND. Like you say perks are a plus but content is everything. At the minute im reading this on my phone as we have just moved and have no Internet. I have still been writing blog posts but obviously cant publish them yet. I normally read blogs at 4.30am+ when little one gets me up . (6 today wahoo) or at night when hes asleep. Hi, Hayley! I'm sorry you've been feeling down lately. For what it's worth, I'm a big fan of your blog and being pregnant myself (9+3! ), it's nice to trawl through your archive and find out exactly what's in store for me without it being sugar coated. I read in a previous post that your doctors thought that you might have Rheumatoid Arthritis? Have them check out Ankylosing Spondylitis, too. My partner has it and suffered from the same symptoms you describe. He cut out starch in his diet, lost several stone and his pain is now managed with medication and exercise. Sorry you have been feeling this way about your wonderful blog. Yours is one of my daily reads, since I got in to reading mummy blogs, yours is one that inspired me to start my own. Thanks so much for commenting (and emailing!) Lucinda, I truly appreciate it. It really touches me to think that I have inspired someone like you, I very much enjoy your blog and you have a great writing style, so to think I helped at all is wonderful. I'm so glad you posted this. You already know that I feel that my face no longer fits, but don't want to give up because (most of the time) I enjoy blogging despite not being a great writer. I'm glad that you didn't decide to quit in the end. It would have been a shame. So I just want to shout out to all of those readers who got in touch with you and say "Thank you". They may have given you that confidence boost that you needed. Good luck with everything and you know where I am if you need me. Thank you for your honesty it's refreshing. Please don't feel ever like your blog isn't worth it as is and I love reading it. Blogging is something that I like to do too and I always think if my words have touched or inspired just one person than that's all I want it to do. You inspire me and I am sure many others and perhaps I should be learning to comment more so that you know we are here and we are reading. The blogs that always speak to me the most and the ones that are heartfelt and truthful, you really have put yourself on the line by sharing your fears and worries about your life and that's far more brave and courageous than a blog giveaway or getting a good freebie. Those people that have perfectly tidy houses are not real. I too have a blog and it's something more of a hobby and I dearly wish I had more time to write its hannahshelpinghand.blogspot.co.uk if you want to have a look. Please keep blogging and being you. Hi Hannah, thank you so much for taking the time to comment. Your words have really helped and encouraged me more than I can express. It means a lot to me to think I have inspired anybody. please keep blogging, in a way that suits you. i've been blogging for years (sadly the site i used shut down a few weeks ago) & sometimes it felt good just to spill everything out. Hi Hayley, I just wrote you a huge reply then signed out of my account and lost it all grrr ! It basically said I know exactly where you are coming from, it's far too easy to get sucked in to comparing yourself to others especially when it comes to blogging, but I've started reminding myself that my blog is going to be a lovely memory to look back on in years to come, a document of my children growing, my pregnancy experience and the fun and not so fun things that happen along the way. I found your blog a few months ago and always catch up on a Sunday so I tweeted you to check my bloglovin wasn't playing up, it would be a real shame for your blog to disappear, I might not comment but I always read. I've stopped reading a lot of my fave blogs lately because they seem to have moved away from the posts about family life, fun activities and great ideas and now only do posts about what they have bought or how perfect their homes are, sometimes they are all reviewing the same product and it's just boring. Hope you start to feel better soon, try not to be too hard on yourself, if you fancy a nosey at my blog it's http://www.adventuresinwebsterland.blogspot.co.uk/ it's still in it's early days but I'm still deciding where I want to take it. Hi Angela. Thanks so much for commenting (especially after your first comment disappeared!). That is very true - it will be great to look back on. I definitely need to get back to blogging for me, and not for what I think I should be doing to keep up with everyone else. I read all your posts. I'm not a fan of reviews of things on blogs, I just like to read about people like me. I'm a mum of 2. My youngest is one in April so around Tynes age:) keep blogging! Sometimes I feel exactly the same way and get sucked in, then I realise its best just being me. After all the main person my blog is for is me and me family so we can look back on what we have done. Hi Hayley, I am sorry you have been feeling like this but please remember you are beautiful inside and out. Not only that but you have a gorgeous baby, loving partner and a highly successful blog. I found out a while ago that comparing ourselves to others will only lead to misery. There will always be more successful and less successful people around, we just have to be the best we know how to be. Dealing with your health isn't easy (as I know only too well) but you are very strong and resourceful so hang in there. And yes, do your blog for you firstly, not your advertisers, because that is why your followers love you. Hi I'm rubee and I really enjoyed reading this post. It's refreshing to read something so honest. I'm sorry you feel down and I hope you soon feel better. As for a little bit about me, I have a 5 week old baby girl, I live in the north east and I'm currently on maternity leave from my job as a primary school teacher. Right now I'm sat reading blogs on my ipad whilst my husband is feeding our baby girl next to me. Hope your ok Hayley, I read and keep up with your blog. I enjoy reading it! I'm so sorry to hear you are having a hard time lately. I really love reading your blog and must admit it was one of the few that made me want to share myself. I even remember lusting over your hospital bag, I don't always comment but I read. You have an amazing little family and loads of people that adore you. I hope a rainbow comes out of the rain clouds soon. I recently got involved in blogging because I enjoy writing (whether I'm good at it or not seemed irrelevant). I also wanted somewhere to log my journey as a single mum & possibly just talk about anything I wanted, be it books, beauty, kids toys, days out, whatever! Along the way I have been lucky enough to be randomly offered opportunities to review products but I have noticed, as you said, that unless you cut a pretty picture a lot of people aren't interested in what you have to say though. It's at times like that I try to remember that I didn't start my blog for those reasons. If people want to read &/or comment then great. If they don't, well that's ok too.